Here's a "What If?" 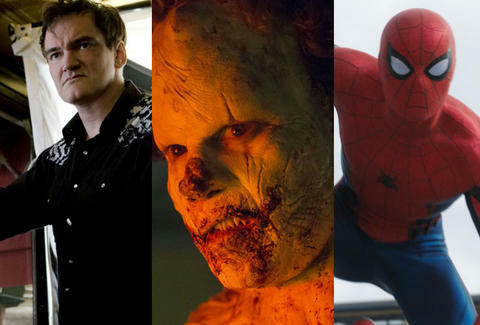 to chew on: if Quentin Tarantino never made Reservoir Dogs, the Spider-Man that swung into Marvel's Captain America: Civil War earlier this summer (and will soon star in his own blockbuster spinoff) would look completely different. Sound like a reach? Not quite. Horror maestro, Inglourious Basterds co-star, and Hollywood maven Eli Roth is the key to this theory, and his new movie Clown, which hits theaters and VOD on June 17, is the Sliding Doors moment. Clown is a slasher-creature feature hybrid with a wicked sense of humor, following a man who slips on a weathered clown suit and transforms into a slobbering, bloodthirsty harlequin, or exactly what coulrophobics fear the most. Unlike his personal projects Cabin Fever, Hostel, and the recent Knock Knock, Roth didn't direct Clown but helped director Jon Watts get the movie off the ground as a producer. Watts, who wowed Sundance crowds with last year's indie chase movie Cop Car, is currently prepping to direct 2017's Spider-Man: Homecoming. See where this is going? When Roth caught wind of Clown, Watts was a commercial director looking for a break. He gambled his career on a prank that could have easily blown up in his face. In 2010, Watts uploaded a fake trailer for Clown to YouTube. The credits read "Directed by Eli Roth." Instead of calling his lawyers, Roth hunted down the guy who directed the minute-long video. "Everyone thought I made the movie and I thought, 'Well, this is so good, I'm going to take credit for it,'" Roth tells us. When Roth phoned up Watts for the first time, the budding director thanked him for not suing. "I said, 'Jon, please. Let's wait until we make money, then we can sue each other. This is Hollywood. You only sue after you've made a fortune on something.'" On top of being impressed by Watts' footage, Roth admired the renegade spirit of screwing with an established person's reputation. "That's something that I would do," he says. Or did. Back in 1995, when most of his NYU film school colleagues were directing serious dramas or experimental art films, Roth shot a crazed, half-animated Tarantino parody for his senior thesis. Restaurant Dogs plugged fast-food mascots into the roles of Reservoir Dogs, a concept that delighted Roth and pissed most of his professors off. "People at my school said, 'Oh, Tarantino will sue you,'" says Roth. "I said, 'I hope he does. It means he's seen it!'" Restaurant Dogs went on to earn a Student Academy Award nomination. Not only would Tarantino eventually see Restaurant Dogs, he'd befriend and collaborate with the rambunctious genre buff. Roth makes it very clear: no one handed him the keys to success. He fought for years to make Cabin Fever after writing the script in college, and when the movie was finally in the can, it produced some of the lowest audience test scores in the history of LionsGate Films ("You want to get 100, [Cabin Fever] got a 19," Roth says). Reports suggest that the movie earned around $100 million after DVD sales. It's a fact Roth still walks into a room shouting. He can make money for moneymen while sticking to horrifying concepts -- which is how he got Clown made for Jon Watts. A stamp of approval means something. In a 2004 interview with Premiere, Tarantino called Cabin Fever "the best new American film." When it came time for Roth to jump to the big leagues with Hostel, he had another banner to wave in meetings: "Quentin Tarantino Presents." The coed-torturing horror movie would also earn miserable audience test scores, but it didn't matter. Roth was protected by a powerhouse and his own vision. "How do you know what audiences are going to want? You don't. You just go out and you make the best movie you can, and then you make another one." Which brings us back to Clown, shot in 2012 and only just now creeping into theaters. Watts' increased visibility isn't the only reason. When you write a crackling satire that also involves bloody murder, strategy is required. "What's fun about doing movies at this budget level is you can take chances," Roth says. "You look at It Follows, Babadook, and The Witch, they're all made at this budget level and aren't conforming to the norm. As a producer, to literally take the first fake trailer with my name on it to a movie that's in a movie theater, I'm very proud of that ... Whether or not it's me, someone else would have eventually given [Watts and co-writer Chris Ford] that break because they were due. You could tell they were about to pop." True. Watts wasn't the only candidate for Spider-Man: Homecoming, but the same way he impressed Roth, he impressed Marvel head honcho Kevin Feige. "We really liked [Jon's] movie Cop Car," Feige said in an interview last July. "We met with him four, five, or six times, and each time he had more and more interesting things to say. And at Marvel, it always comes down to ultimately, 'We can make a movie with this person for two years, we could spend almost every day with this person for two years. Let’s go.'" Watts is now an established director, his sadistic directorial debut is out in the world, and the future of Sony Pictures' flagship superhero franchise is in his hands. What if Tarantino didn't shepherd Eli Roth's Hostel, Roth didn't become a savvy producer with the muscle to get movies made, and Watts never posted that trailer provoking Roth into action? Well, we don't have to worry about that -- it happened.